Hemolysis, or the rupturing of red blood cells, is the most common reason why a blood sample is deemed unfit for laboratory analysis. 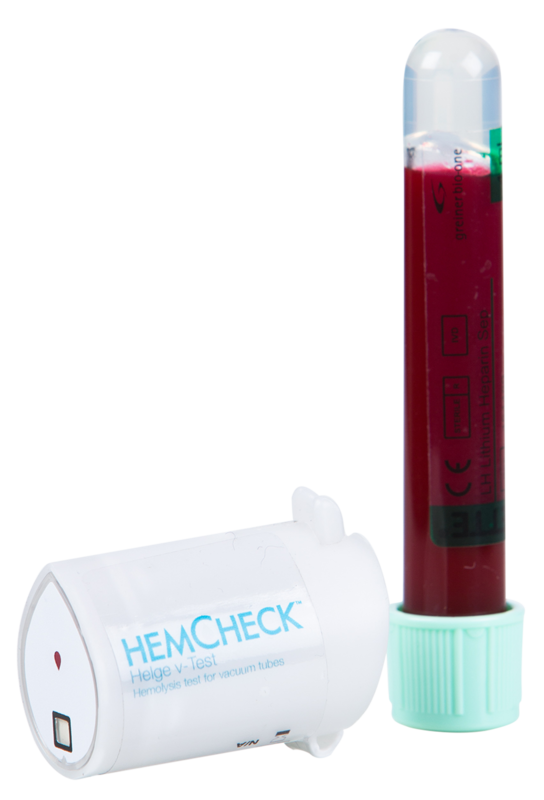 In fact, 45 million blood tests fail every year, worldwide, due to Hemolysis. When a blood sample can’t be analysed it results in delayed treatment, spiralling healthcare costs, increased workloads for healthcare professionals and above all, unnecessary suffering for patients. HemCheck operations are based around the Helge product concept. The product consists of two different disposable tests, one for test tubes and one for blood gas syringes, both of which can be used in the same reader. 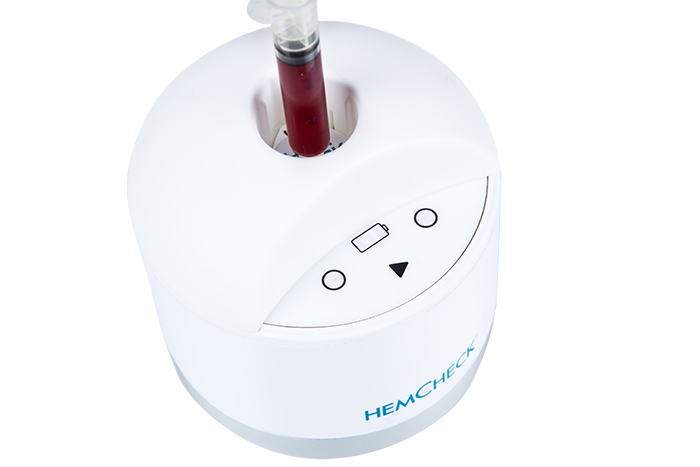 With a simple push of a button, the reader quickly shows if the blood sample is hemolyzed or not. The aim is to identify hemolyzed blood samples at the time of sampling (point of care) and with the same quality as a laboratory. 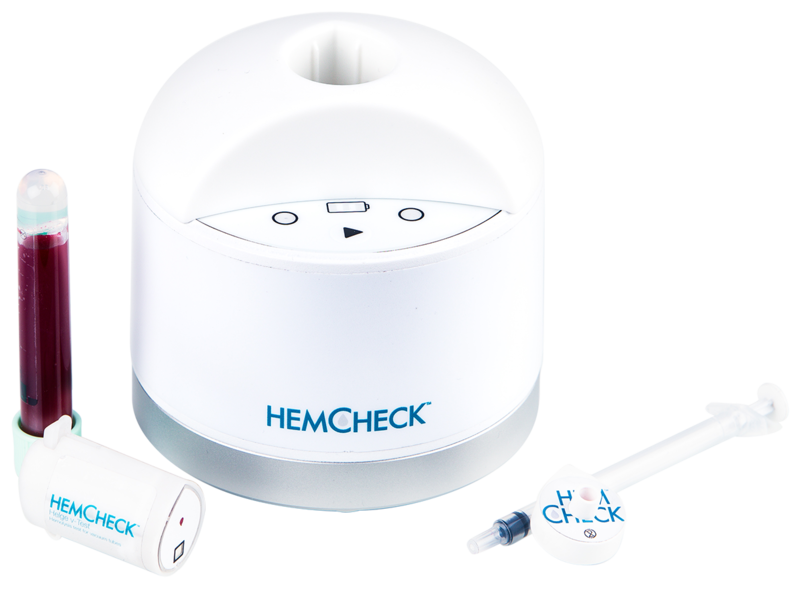 The HemCheck test has been under development for several years and has originated out of need, innovation and user-friendliness. 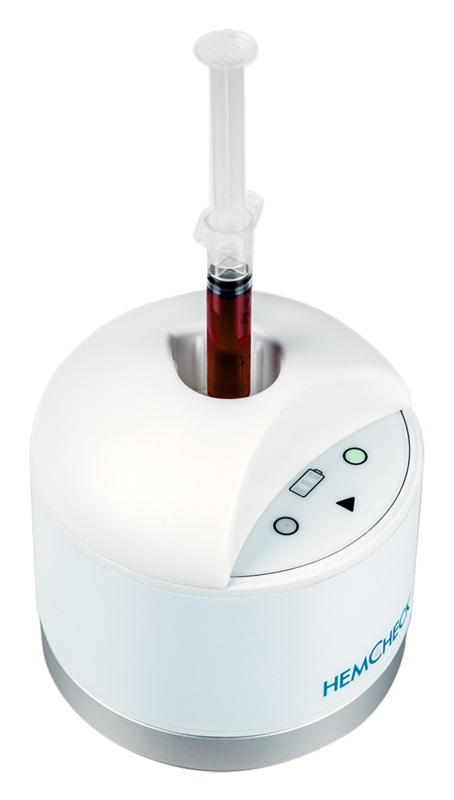 The single-use test works when a small amount of blood enters the disposable test device, where the plasma and serum are then separated. The device is then placed in the digital reader and within a few seconds the blood is analysed. Helge signals if the sample is hemolyzed or not. Single-use tests for test tubes are possible using a cylinder-shaped plastic housing with reading windows adapted for the digital reader. The cork on the test tube does not need to be opened and is instead activated by penetrating a needle into the blood sample cork. A needle guard protects the user. The concept is patented. Today’s instrument for blood gas analysis lacks technical prerequisites for detecting hemolyzed blood samples. The purpose of a one-time test is to provide healthcare organisations with an opportunity for improved safety in blood gas analyses – the same quality as laboratory tests but with faster and easier results. The product concept is under development. Technical Description: Single-use tests for blood gas syringes consist of a plastic connector with a reading window adapted for the digital reader. The blood gas syringe is placed in an opening on the top of the connector and a small amount of blood is dispensed into the test and then placed in the reader. For easy and user-friendly reading of disposable tests, there is a common reader that, with a simple push of a button, signals if the blood sample is Hemolyzed or not. The scanner is activated with the pressing a button, starting the evaluation of the disposable test. A photometric analysis of plasma / serum is performed. The answer is communicated through a red and/or a green lamp. The reader is mobile, easy to clean and can easily sit on a trolley or next to a blood gas analysis instrument. Today it can take up to one hour for a blood sample result to come back from the laboratory to the sampler. Helge performs the same analysis in a matter of seconds, opening up new possibilities for assessing blood sample quality. M. J. Hallworth, ”The 70% claim: what is the evidence base?,” Annals of Clinical Biochemistry, vol. 48, pp. 487 -488, 2011. P. Bonini, M. Plebani, F. Ceriotti and F. Rubboli, ”Errors in Laboratory Medicine,” Clinical Chemistry, vol. 48, no. 5, pp. 691-698, 2002. P. Carraro and M. Plebani, ”Errors in a Stat Laboratory: Types and Frequencies 10 Years Later,” Clinical Chemistry, vol. 53, no. 7, pp. 1338-1342, 2007. R. Mozzi, A. Carnevale, C. Valente, A. Dolci and M. Panteghini, ”Recording, monitoring, and managing pre-analytical issues in a metropolitan university hospital,” Biochimica Clinica, vol. 37, no. 2, pp. 95-99, 2013. G. Lippi, N. Blanckaert, P. Bonini, S. Green, S. Kitchen, V. Palicka, A. J. Vassault and M. Plebani, ”Haemolysis: an over view of the leading cause of unsuitable specimens in clinical laboratories,” Clin Chem Lab Med, vol. 46, no. 6, pp. 764 -772, 2008. G. Lippi and G. C. Guidi, ”Risk management in the preanalytical phase of laboratory testing,” Clin Chem Lab Med, vol. 45, no . 6, pp. 720-727, 2007. Worlds Health Organistation, ”Use of Anticoagulants in Diagnostic Laboratory Investigations,” Worlds Health Organistation, Ge neva, 2002.